Norwegian Cruise Line Holdings CEO Frank Del Rio said the company’s decision to return to the Eastern Mediterranean in 2019 is working out so far. After pulling out of the region in 2016 because of terrorism fears and political instability in Turkey, NCLH has scheduled 12 sailings this year and has an additional 20 on the calendar for 2020. “All 12 sailings in 2019 are better loaded and at higher pricing than the surrounding sailings that do not include Turkey,” Del Rio said. He told investors on a conference call to discuss fourth quarter and 2018 earnings that Turkey is the key to the itinerary. “The fact that the North American consumer, who is the one booking most of these Eastern Mediterranean cruises, seem to want to come back to the eastern Med and is willing to pay a premium price bodes very well for 2020,” Del Rio said. The risk is that itineraries must be developed and sold 18 to 24 months in advance of sailing, he continued. On the call, Del Rio said NCLH enters 2019 in the best-booked position in its history, giving yield managers more leeway to raise prices. In addition to Norwegian Cruise Line, NCLH operates Oceania Cruises and Regent Seven Seas Cruises. The company had net income of $954.8 million in 2018, up 25.6% from the $759.9 million recorded a year earlier. Revenue rose 13% to $6.1 billion. Last year, NCLH decided to redeploy the Norwegian Joy from China to Alaska, where it will cruise starting in April alongside sister ship Norwegian Bliss. That will increase NCLH’s presence in Alaska to 9% of total capacity, up from 7% last year. Capacity in the Asia Pacific region will drop to 6% from 12% last year. NCLH will have six ships in Europe this summer and capacity there increases to 23% from 20% last year, while year-round capacity in the Caribbean is pegged at 36%. A ‘world-class’ team of designers has been recruited by Cunard to create the interiors for its new ship. Design details of the as yet unnamed vessel, due to join the fleet in 2022, are still under wraps. 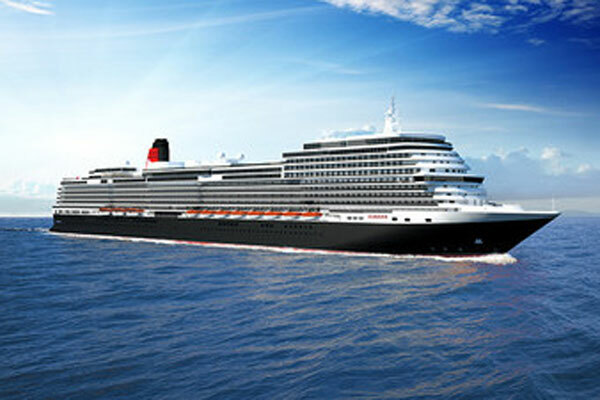 However, award-winning designers Simon Rawlings, of David Collins Studio; Terry McGillicuddy, Richmond International and Sybille de Margerie of Sybille de Margerie Paris are already working with the creative director, Adam D Tihany, on Cunard’s fourth ship. The ship is Simon Rawlings’ first project at sea, with responsibility for the atrium, grand lobby, the Queens Grill suites and the main dining room. Past projects have included Kerridge’s Bar and Grill, Corinthia London and The Apartment at The Connaught. French interior studio, Sybille de Margerie Paris, whose projects have included The Mandarin Oriental Paris and Cheval Blanc in Courchevel, will handle retail spaces, the spa and the flagship Queens Room in its first work on a ship interior. Richmond International, which counts The Langham London and the award-winning Four Seasons Budapest among its clients, will be responsible for the theatre, new entertainment spaces and the outside deck area. Cunard president Simon Palethorpe said: “The calibre of talent we have brought together for this project will bring to life our vision of creating a truly world-class ship. The new ship will be the 249th vessel to sail under the Cunard flag and will bring the luxury line’s fleet up to four vessels for the first time since the 1980s, joining flagship Queen Mary 2, Queen Victoria and Queen Elizabeth. Click on the image above to witness the collision. 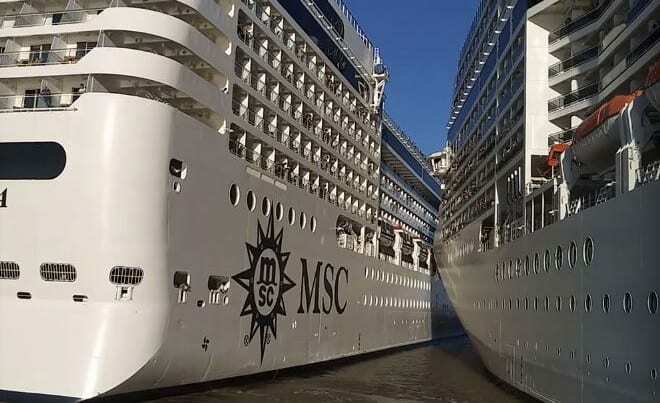 Dramatic footage captured the moment two massive cruise ships smash into each other outside a busy port. The MSC Orchestra, a 92,000-tonne ship, collided with MSC Poesia as it tried to leave Buenos Aires, Argentina. One onlooker can be heard shouting “No, no, no” in the shocking footage which captured the prang on Wednesday afternoon. The vessel crunched into sister ship MSC Poesia but somehow no one suffered serious injuries. But debris can be seen crashing into the water at Buenos Aires in the video. Both MSC Orchestra and MSC Poesia are popular with Brits and have been deployed this summer take tourists on cruises around Northern Europe. It’s unclear though if any Brits were on board either vessel at the time of the crash. Each ship has a capacity of 2,500 passengers. The Orchestra suffered minor damage in the shunt. Following an investigation, the ship was cleared to sail. But it was delayed as it set off on an eight-night South America cruise with stops in Brazil and Uruguay. MSC Cruises, founded in Naples, Italy, but now based in Geneva, Switzerland, is the fourth largest cruise company in the world.